You wish to pre-plan your own funeral. Despite the fact that human beings have a 100% mortality rate, most people in Ireland act as if even talking about end-of-life planning causes people to die! A funeral is both a beginning and an ending, where the end symbolises that the journey from birth to death has been completed and the beginning symbolises the recovery and renewal process for the loved ones still living. 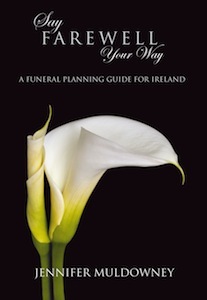 The main purpose of SAY FAREWELL YOUR WAY is to encourage conversation about death, dying, funerals and loss in Ireland today and, hopefully, to open your minds to the endless possibilities there are when it comes to funerals. It aims to inspire independent individuals to celebrate and take control of the last memory they will leave loved ones. Despite the fact that death is the one guaranteed event in everyone’s life, many people in Ireland feel uncomfortable about discussing death, and how to handle it. A new book, SAY FAREWELL YOUR WAY, aims to change all that. Written by Jennifer Muldowney, it is full of practical information on digital legacies, traditional funerals, cremations, organ donation and alternative funerals and casts a refreshing light on a taboo subject. In a recent survey, it was revealed that almost two thirds of participants had not thought about their funeral wishes. Jennifer hopes to encourage conversation about death, dying and loss in Ireland today. This is a recently published book which deals with the issue of funeral planning. The author is a 30 year old woman who lives in Dublin and who runs a specialist funeral business planning funerals. Although she did not grow up surrounded by death and neither has she lost a large number of people close to her, she considers herself to be a reflective and thoughtful person. This book is a product of her reflection on contemporary funeral planning and explores how one might be guided or directed to deal with practical matters at at time when one is easily and understandably distracted by grief and pain. The purpose of her book she states is ‘not to frighten’ but rather to ‘prepare’. Muldowney asserts that is only when one accepts that death is a reality and can happen to any of us, at any time that one truly begins to live. Written in a simple and straight-forward manner, this book looks comprehensively at the many issues that a person is faced with when either planning their own funeral or that of a loved one. Muldowney includes a lot of practical advice and direction on sever aspects of funeral arrangements, ranging from: choosing a burial place – whether to bury a person or have them cremated; ought there to be a eulogy at the service or not; to what kind of food might be served after the service. Moreover, her book reminds the reader of the many legal items that need to be attended to immediately after a death and indeed in the longer term. In conclusion, I contend that this is quite a useful resource for parishes, funeral directors and anyone considering pre-planning a funeral.